This week for Tuesdays with Dorie, Babette of Babatte Feasts choose Tartest Lemon Tart. I was intrigued with this recipe because it used whole lemons, not only the fruit but the pith and peel. Lemon zest adds another layer of lemon flavor and I'm all about laying flavors. 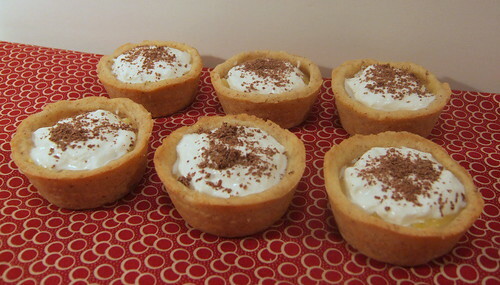 However I did change this recipe and made mini tarts. I made a full recipe of Dorie's Sweet Tart Dough with Nuts and used Almond Meal. A full recipe of the Sweet Tart Dough with Nuts made exactly 8 mini tarts. Then I cut the Lemon Custard recipe in half and made in on my stove top like a pudding. First combining the cream, cornstarch, sugar, eggs and butter and bringing it to a boil and allowing it to thicken. I then set it aside to cool and blended in the minced lemon. 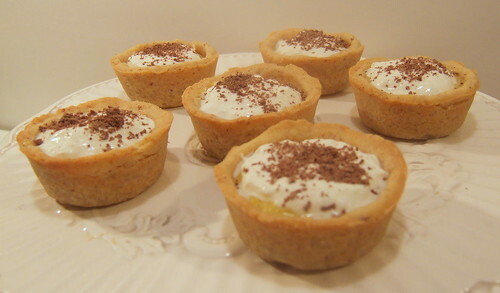 I filled 8 mini tart shells with the Lemon Custard, topped with some whipped cream and chocolate shavings. When I was making the Lemon Custard I almost cut the sugar down and after tasting I wish I had. I like a very tart lemon flavor and the 3/4 c. sugar should have been cut to 1/2 c. sugar and I think my Mini Lemon Tarts would have been perfect. Cut lemon in 2 and remove pits and cut into small pieces. Put lemon in FP and mince. In a small sauce pan, mix cream and cornstarch until cornstarch is completely dissolved. Whisk egg and yolk and blend into cream mixture. Heat and add the 2 TBL butter 1 TBL at a time. Bring custard to a boil and when it thickens a bit remove and cool for about 5 minutes. Blend in minced lemon and fill cooked tart shells. They are too cute. They also look like they have the perfect crust to filling ratio going on. I like your idea of making them into little tarts, then you can't go overboard! I noticed from your profile you live in Barrington, I live in Oak Park, so not that far apart. My sister has a food blog too at www.biz319.wordpress.com and she lives in Cary which is even closer to you! I just found your blog today and can't wait to read more! Very interesting to cook the filling on the stove top. It solves the bubbling over in the oven issue! Well aren't you just rockin' the house with those tarts. What a great idea to cook the filling separately! Your mini tarts are adorable. Love how you adapted this recipe! Love your idea of cooking the filling separately. I wish I'd done that! The minis are so cute and they sound delicious! Lemon really appeals to me as the weather gets warmer. Love that plate and the linen you have styled your lovely little tarts upon! They are lovely little tarts...I get so excited to see all the minis always...I would love to do minis, but can you imagine the guys if I set those out...they would be popping those in their mouths like cherries and just as fast. Someday. Yours look so cute with the sprinkles on top...you are always such fun with things like that. Love your little minis. They look delish!! Mine was really tart even with the amount of sugar called for. Guess it depends on the lemons.